What would make you stop? A glowing greenhouse? A rolling theatre or how about a super pier? 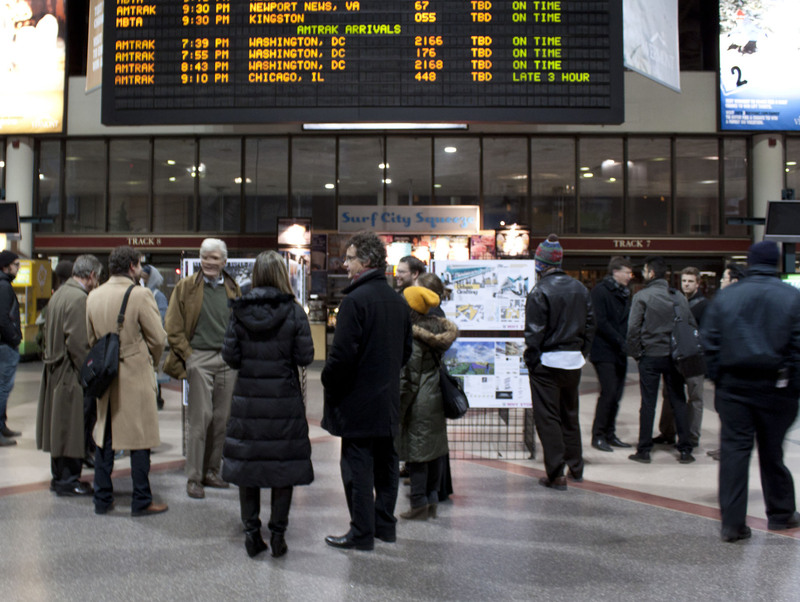 This summer SHIFTboston challenged architects, urban designers, designers and landscape architects — professionals and students — to visualize new destinations along the proposed South Coast Rail extension, a new rail that will connect Boston to Taunton, New Bedford, and Fall River, Massachusetts. This international competition generated brilliant concepts for a new, vital urban network along the railway from 5 countries and 7 states. 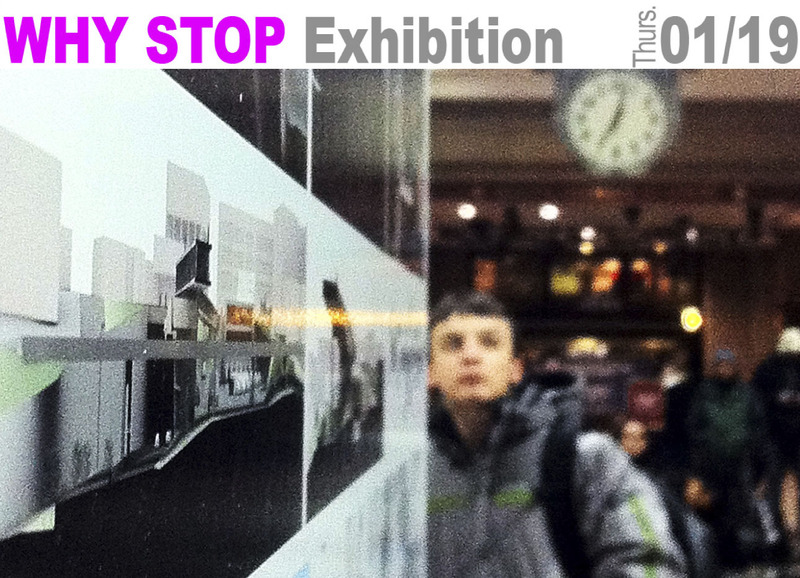 Winning and select submissions from the WHY STOP Competition have become part of the WHY STOP Exhibition at South Station in Boston Massachusetts. The winner and three honorary recipients presented their proposals at the opening of the exhibition on January 19, 2012. Attendees included competition participants and a number of local leaders in architecture, academia and government including competition advisor Edward Mitchell assistant professor of Yale University, Fred Koetter of Koetter, Kim and Associates and Richard Henderson, Executive Vice President of MassDevelopment. The opening began with a comprehensive presentation by the competition winner, Emer O’Daly of Dublin, Ireland. Emer’s ‘New Bedford Super Pier’ proposal establishes New Bedford as a regional infrastructural hub for New England. Following the winner were presentations by three honorable mentions: Marcus Martinez and Ana Ansari of AlloyBuild Somerville, MA presented Urban Grafting; David Yang and Amir Shahrokhi of DnA, New York, NY presented AgroLand; and Chris Aubin of New York, NY presented Sky Lab. Presentations were followed by a celebration at Sorriso Trattoria in the Leather District. will move to select locations in New Bedford and Fall River. Agroland is a reconsidered form of agricultural settlement that seeks to reinforce the cultures of local food production and family farming while reconciling the economies of food production. By analyzing traditional homestead farms and various aspects of industrialized agricultural practices, the project arrives at innovative hybrid models of modular homesteads and small-scale, high-productivity enhanced farming outfits. Agroland will not only serve as a regional market and distribution center, but will export new models of living and food culture, ultimately attracting a diverse constituency of individuals who wish to live work, shop and learn around it. A bold appreciation for the capacities of existing systems strategically relocates the site to the more dense and historic downtown area as a ‘superblock’. This reinforces established public spaces, businesses and services for new ventures. The fusion of he plaza assemblage directly with the rail form a new perspective on the train cab as the public realm, transforming the rail cabs into a spatial catalyst or spontaneous theatre or marketplace. The compound response delivers a new value through the serial arrival to the city and a kinetic public realm. For more than 10 years, Fall River city officials have considered taking down the I-195 double stacked connector. This submission proposes transforming the derelict right-of-way into a new gateway for the city. This new ‘Sky Lab’ will re-purpose the sturdy piece of infrastructure, a more sustainable approach that eliminates the costs associated with removing it. 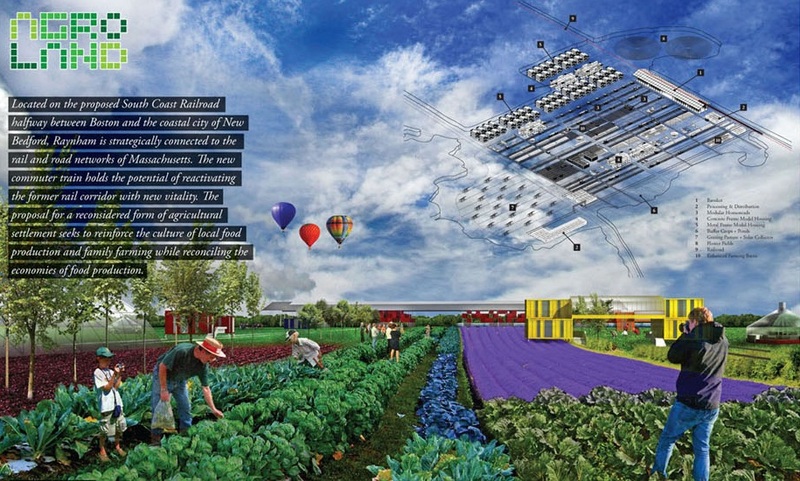 The authors of Sky Lab propose transforming the lower levels of the double decked highway connector into incubator spaces for the region’s emerging bio-tech sector while energizing the upper levels with a public greenway for cyclists, pedestrians and outdoor programming. The New Bedford Super Pier creates a new waterfront center for New Bedford while establishing the city as a regional infrastructural hub for New England. The city of New Bedford sits at the end of the South Coast Rail line. Currently, the PROPOSED train station is positioned north of downtown, which unfortunately will cut it off from the waterfront and the community it will serve. New Bedford Super Pier proposes rotating the station OUTWARD from this location toward the river in the form of a pier, tying into the existing infrastructure and reconnecting the town with the sea. The New Bedford Super Pier also becomes a ferry terminal for all of the New Bedford passenger ferries which depart daily to the Massachusetts South Coast Islands. These two infrastructural elements combine to form a major transit oriented hub with commercial and public programming throughout from downtown area to the waterfront. In addition to transportation, the pier would house open markets, food production spaces, performance spaces and landscaped parks. The pier would become a hub of activity to which visitors would have easy-access by rail, car or ferry. In this way, a new waterfront urban centre may be defined for New Bedford ensuring its establishment as the primary infrastructural hub of southern Massachusetts and the South Coast Islands.